In an age where even a temporary malfunction of a web site or a mail server means loss of business, productivity, or communication, it is important to make sure that your Internet services are running around the clock. The ability to be notified when such services fail is just as important to avoid bad surprises. Well, you don't need to stay glued to your monitor, or get a call from an angry boss or customer. You just need Netoscope. Netoscope is a simple and effective tool to monitor Internet services such as web, ftp, or mail servers. 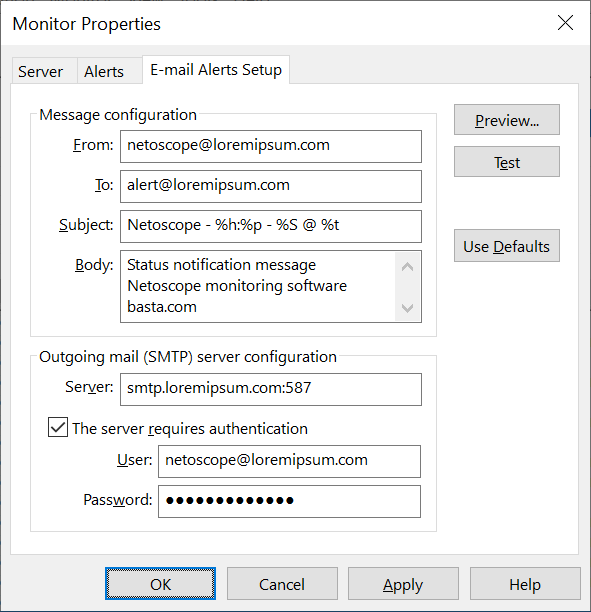 When a monitored service fails, Netoscope can notify you about it or even correct the problem if possible. This makes it a useful tool for both client and server machines. Netoscope provides several ways to respond to failed services. Audio and visual notifications can alert people near the machine. E-mail notifications can be used to inform a wider range of remote operators. This includes paging on-call staff if their cellular phone or pager can accept e-mail messages. Netoscope also provides a batch processing feature which can be set to run applications in response to failures. This gives you the opportunity to attempt an automatic restart or recovery of the service. Negligible load on targeted servers. 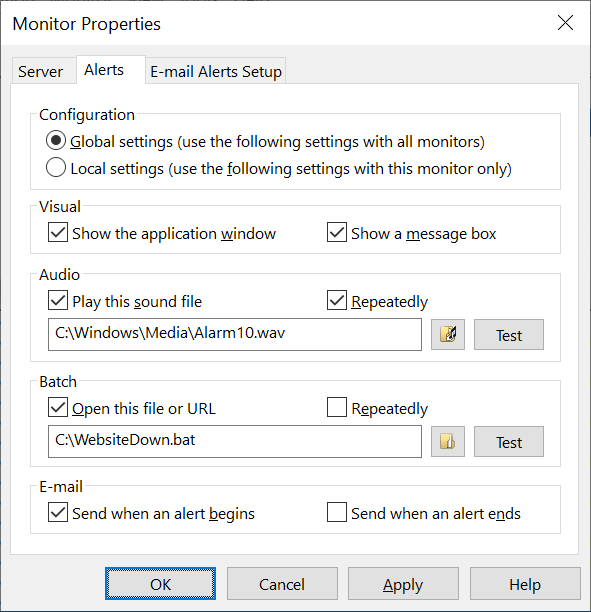 Multiple alert methods including e-mail, audio, and visual feedback. Automatic response to failures using batch processing. Added a Ping option to verify whether Internet services are online. Added a verification timeout to take action when Internet services are slow to respond. 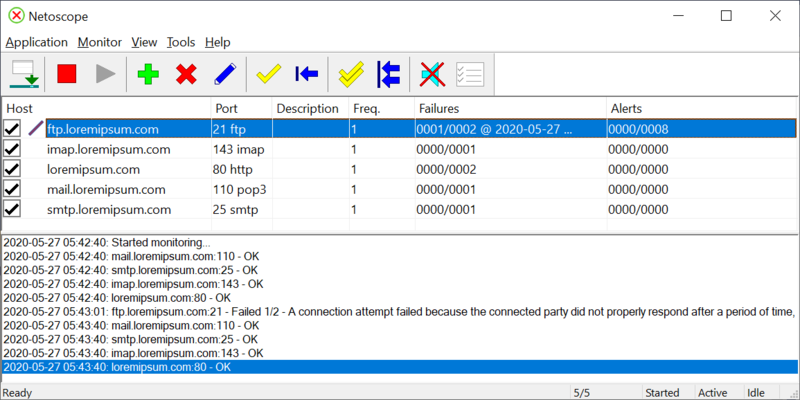 Improved the select and view log file buttons interface. Replaced the MAPI dependent e-mail notification system with a standalone SMTP client. Added a feature to back up and restore the program data file containing user settings and monitors. 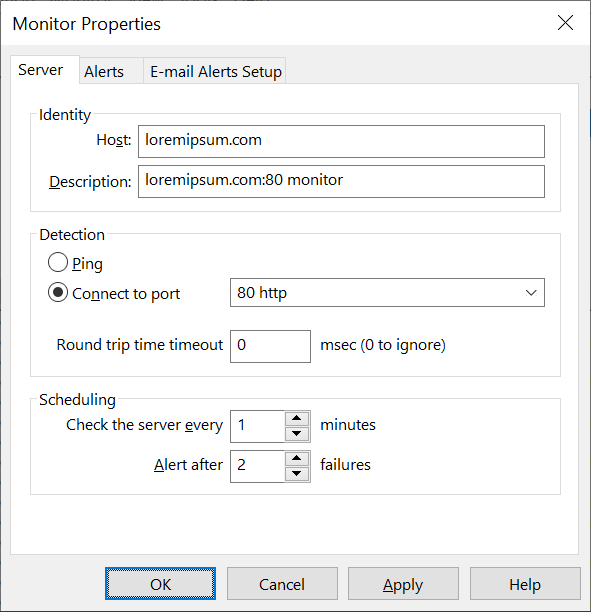 Redesigned the e-mail sender to use Microsoft MAPI and simplify smtp restrictions. 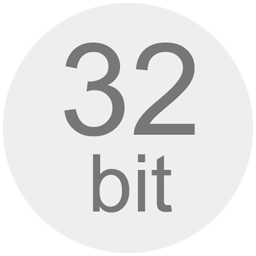 For Windows XP or later: Added support for Windows XP features. For Windows 2000 or later: Added support for multiple Windows user accounts. Minimized the amount of memory used when the main window is hidden. 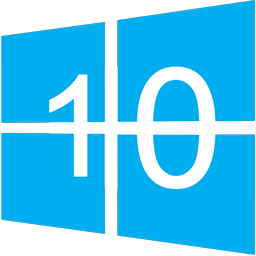 For all Windows versions: Added placeholders. Showed the main window when trying to run a second instance of the application. Overhauled the help system. 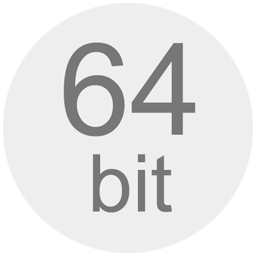 Discontinued Windows 95 and NT compatibility. Added support for multiple e-mail recipients and stopped e-mailing after recovering from warnings (partial alerts). Added e-mail notification and support for placeholders in sound file names. Displayed the application system tray icon after logging on when the program is used as a Windows service, and fixed a batch processing bug that was introduced in v1.1. Saved user settings more frequently to avoid possible loss during an abnormal termination of Windows. Added batch looping and alert text placeholders.